This dvd is a must for the ALCO diesel fan. The first show captures the CP 4500's and 4700's working container trains and general freight between Montreal and Detroit. We see behind the scenes, aboard the trains, and trackside views. There is good coverage inside the cabs of these big Alcos on the CPR. There are some meets and a scene exiting the Detroit River tunnel in Windsor, among other things. This show has a lot to offer. The other program is "Alco's in the Highlands, which takes you to Nova Scotia with spectacular east coast scenery. You will see hard working 6 motor Alcos hauling 100 car trains and are captured trackside as well is in the cab of the trains along the various portions of the Cape Britain, and Centrai Nova Scotia line. Most of the ALCOS are ex CN power. This is a nice variety of scenes and places which was probably one of the last strongholds of ALCO power in CANADA. Narration and live train sounds, with quality camera work and equipment. We watch trains. Some people enjoy GE's, while other's enjoy EMD's. But there nothing quite like the Alco's. Every rail fan seems to enjoy seeing an Alco. The sound alone is captivating. Canadian Pacific Railways was one of the last mainline railroads to say farewell to these magestic giants. Rail Innovations presents this exciting program of the CPR and their Alco's. See the workings in Montreal Quebec around the yards and to the Montreal Wharf, Then on for a quick trip aross Southern Ontario with stops near Winchester, and in Smiths Falls, and Port Hope Ontario then on to Toronto, Woodstock, Thamseford and Windsor, with a stop in Detriot Michigan. Footage is both from the cab and the ground. There is plenty of open farm land, followed by bush and lakes, then after the city back to the farm land. A fine tribute to the last days of mainline Alco's. Then it's on to Nova Scotia and Shortline action on the Cape Breton & Central Nova Scotia Railroad. The Alco's live on, working up grades through this picturest country side, pulling loads of coal and general merchandize. Watch as the trains weave around lakes and Atantic inlets, over bridges and on from Sidney N.S. to the change point with the CNR at Truro N.S. Like the 1st part, see views from the cab, and from the ground. There is no video quite like Six Motor Alcos. Rail Innovations has done a fine job bringing us this excellent video production. Well Done. rick.schonfelder (Melbourne Australia) on 2014-04-25 18:07:00. This is a good video of an area of North America not necessarily thought of. The interesting feature is the part where the CPR goes through the now famous Lac-Megantic. Of course no mention is made of the fact as the video is from the late 1980s. The video footage of CB&CNS is historical and worthy of viewing. Conversion from Video does not impair the DVD version so I recommend the purchase for those interested in the area and time period. Steamboy (Revere MA US) on 2019-02-08 19:45:53. 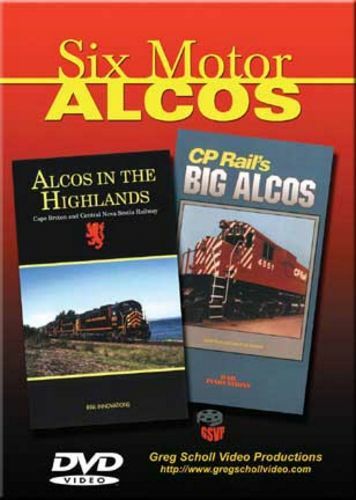 In Canadian Pacific�s Big Alcos, the program starts with a fast intermodal, followed by a brief history on the alcos as the units idle in the yard. Some Norfolk Southern power is also included. A look inside the cab of number 4707 is shown and while the Southern Railway had its own steam locomotive number 4501, Canadian Pacific also has its own alco number 4501. Next a look at St. Luc is shown with some conrail power as well. Engines at the yard includes 69 Rebuilt RS18s, 50 C424s, and RSD17 number 8921. The yard also has a roundhouse and working turntable. A look inside the shops are also included. Next a locomotive start up is shown. Then comes a freight led by 4730, 4500, and 4229. Another freight is rolling by with mostly box cars. At Laval, 4729 crosses a bridge carrying not only a regular freight train, but also hauling a quartet of RS23s. Out of the wharf, 4730 leaves the area behind as it bounces side to side. At the junction, 4704 must wait for 5 SOO line units and an MPI diesel to clear the line. Afterwards, a short cab ride is included. At Hochelaga, a meet with 1685 and 1630 is shown. Like The frisco decapod at the Illinois railway museum, CP also had its own 1630. At Montreal Wharf, some crossings over the tracks are performed, then it rolls through an unprotected crossing. Next a meet with a yard switcher is included as the freight crosses the switches. In the early morning at St. Luc Yard, a look inside the crew shanty is shown, followed by 4713 coupling up to the freight. The cab ride action continues, as it leaves the yard. On the Winchester subdivision speedway, it rolls through beaconsfield at milepost 10.2. A meet with the local commuter train led by F-unit 1302 is shown then comes the station at Dorion, in milepost 18.9. Next a ground level shot is included with a freight led by 4720 and 4500 whistling by the speeder rail car and the crossing. Back in the cab, it crosses the diamond at De Beaujeu in milepost 35.5. Next a fast meet with a mixed train is included. Rolling at 60mph, it passes by the Dalhousie mills at milepost 41.6. A ground level shot of the mills are included. Followed by a shot from the top of the closed roof grain car. Back inside, a meet with another freight is shown, followed by a slow down both from inside and out of the cab windows. At Smiths falls, it passes by a waiting freight at milepost 123.8. Next it passes by another freight, this time it�s right next to the station depot. A crew change is performed, as an intermodal led by 5402 rolls through the platform. Next another freight passes by, this time it is led by 5409. Back on the mainline, the freight passes by a work train with a crane, next it is single tracked as it rolls through curves, cuts, and bridges. At port hope, a VIA train passes by followed by another one, this time with an F40 at milepost 143.2, from inside the alco. Next a fast one led by 4709 is shown, and after that, an unexpected white face unit led by 4569 blares its horn under the pedestrian bridge. The repeated scene from the opening of this video is also shown. At Darlington near milepost 169, a double diesel freight with 4236 and 4725 leaves the siding and onto the single track mainline. At Staines junction near milepost 195.2, 4743 curves to the left of the junction, blares its air horn, and back inside, it rolls through the crossing. A SOO line freight is waiting for us to pass by. Arriving at downtown Toronto near milepost 197, the cab ride comes to a close as it rolls by various cabooses, and makes a stop with a crew change. A soo line freight led by 6411 leaves the yard. At sunset the CP freight also leaves the yard. Next 4569 crosses the diamond and arrives at Lambton near milepost 5.8. Afterwards, another all alco freight leaves the junction, and 4569 crosses the bridge. At campbellville near milepost 38, 3046 pulls the roadrailer train, followed by an all soo line freight blaring its horns for the crossing. Next the big alco freight rolls by. And at Galt near milepost 57.2, another 5 unit freight crosses the bridge. At the crossing, 4743 blares its horn. Then another freight rolls through the countryside at Thamesford near milepost 101.2. At Zorra near milepost 94.9, there is a little bit of camera wobbling as 4719 rolls through the crossing. At the siding it must wait for 5537 to pass by. Next 4719 climbs the hill and blares its horn to the crossing. At Woodstock new milepost 87.8, it goes backwards crossing the bridge. Some S. Urge action is going on as it Rolls through the curves, then at Windsor near milepost 111.2, a 5 unit lash up led by 4710 arrives. At Norfolk Southern�s Oakwood yard in Detroit, a crew change point is happening, then it cuts to the Detroit River tunnel, as 4708 exits the double track tunnel. This concludes the CP big alcos. It ran for only 35 minutes, and it was made in 1992. Both of these programs on this combo DVD was acquired by Greg Scholl in 2011.